The Coolpix L330 is a new addition to Nikon’s Coolpix L series of budget-conscious compact cameras. Taking over from the previous L320, the new model gains a 20.2-megapixel CCD sensor and a higher resolution 460k-dot screen. Aside from these upgrades, the L330 is almost identical to its predecessor and retains the same 26x zoom lens with a focal length range (in 35mm camera terms) of 22.5-585mm. Lens-shift Vibration Reduction is carried over to help tame the effects of camera shake, and HD 720p video recording is another common feature. The L330 also continues the L series trend of being powered by AA batteries, rather than a Li-ion rechargeable power pack. This helps keep the new camera’s list price down to a relatively accessible £179.99 / €199. Take a glance at the Coolpix L330 and you’d be forgiven for thinking it’s a bridge camera: something which gives you DSLR levels of camera control, but with the convenience of a single, fixed super-zoom lens. Turns out only the latter is true of the L330, as there’s precious little in the way of manual control here. Fortunately the camera is equipped with a Smart Auto mode which automatically detects the type of scene you’re aiming at and applies the optimal shooting settings. Alternatively you can switch to a standard automatic mode to gain control over ISO sensitivity and white balance, or opt for one of 18 different scene modes such as ‘Portrait’ and ‘Night landscape’. There’s also a separate mode dedicated to Nikon’s Smart Portrait feature, whereby the camera will automatically select Face-Priority autofocus, delay firing the shutter until your subject is smiling and warn if anyone has blinked. Then the system will fix any red-eye, smooth skin and adjust the overall exposure for optimal highlight and shadow detail. Clever stuff. Switch to standard Auto mode and various colour options are revealed, should you fancy applying vivid, monochrome, sepia or cyanotype effects. But the big talking point with the Nikon Coolpix L330 is its 20.2-megapixel 1/2.3-inch CCD sensor, which is a hefty boost from the L320’s 16.1-megapixel device. The theory goes that more megapixels equals better image quality, but all too often that’s just not how things pan out. Cram an extra 4 million pixels onto a sensor as tiny as the L330’s and each pixel has to be smaller to fit, which in turn makes them less light-sensitive and consequently more prone to generating unsightly image noise in your photos. Add in the automatic noise reduction processing incorporated into most compact cameras to counteract such grain and colour speckling, and the camera is likely to smooth away the increased detail those extra megapixels should have provided. Find out later whether this is true of the L330. There’s no doubting the camera's optical capabilities though. With a 26x zoom range on tap, you’ll be able to fill your frame from most distances, and unlike some super-zoom cameras, the L330 still retains an impressive 22.5mm-equivalent extreme wide angle setting. The lens’ maximum aperture of f/3.1 is also relatively wide considering the huge focal length range and means the camera should cope quite well in low light without having to resort to high sensor sensitivities. Nikon’s lens-shift Vibration Reduction system is implemented to counteract the effect of camera shake and is an essential feature when shooting in low light or at long focal lengths. The only slight bugbear is the camera’s rather dim-witted zooming controls which are slightly sluggish when you want to zoom in or out at speed, yet jerky and imprecise for making fine focal length alterations. 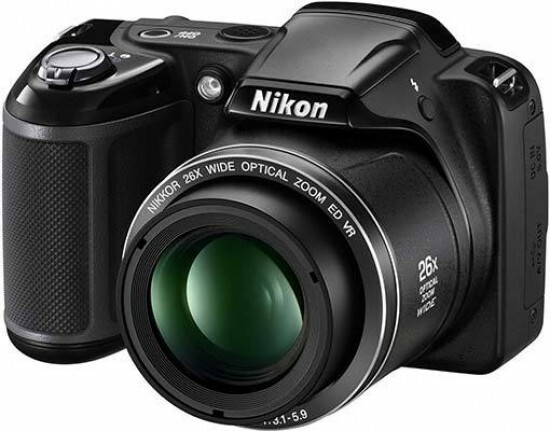 Aside from this, the Nikon Coolpix L330’s controls are well positioned and easy to use. There certainly aren’t many of them, but that means the buttons you do get are pleasingly large and well-spaced, with enough room on the rear panel for a sizable rubberised thumb grip. Team this with the large, ergonomic main hand grip and this is an exceptionally easy camera to hold and shoot one-handed. Despite the large chassis shape, it doesn’t feel overtly heavy either. The large video record button is also well-cited next to your thumb, as are the shooting mode and playback controls. Naturally there’s the usual directional pad incorporating basic settings like exposure compensation, flash and macro modes, plus the self-timer function. Over on the left of the body sits a sole button for ejecting the pop-up flash and just two sockets for connecting a DC mains input and a USB output. Fire up the L330 and it’s ready for action in a spritely 1.3 seconds. You’re then greeted by a clear shooting interface on the 460k-dot LCD screen. Although not particularly crisp, this is still a big improvement over the resolution of the old L320’s monitor and it’s easy to see when shooting in bright conditions. Colour accuracy is also good – If a tad under-saturated – however the screen’s viewing angles really disappoint. Try composing a high-angle shot and you’re pretty much left squinting at a blackened mess. But to be fair to Nikon, equipping the L330 with LCD screen tech that doesn’t exhibit this trait would push up the price. The screen is also fixed and lacks touch-sensitivity to keep costs down, but the menu system is simple and easy to operate using the button controls. Shooting with the Nikon Coolpix L330 is also a somewhat mixed bag. In good light the autofocus system locks on to a subject almost instantly, but it slows considerably in darker conditions, sometimes taking a frustrating couple of seconds to finds its mark. Focus hunting also occurs at longer focal lengths regardless of ambient lighting, whereby the camera sails past the point of focus before backtracking and taking the shot. We also found a couple of our test shots ended up being slightly out of focus, although the camera had apparently focussed successfully during their composition. Another annoyance is the reluctance of the default Smart Auto mode to macro focus. If you want to reliably exploit the cameras 1cm minimum focus distance, you’ll need to change to standard Auto mode and then activate macro mode, which frankly is quite a faff. At least the exposure metering is more dependable, generally striking a good balance between preserving highlight and shadow detail. High-contrast landscape shots can cause it to moderately underexpose, but that does assure you good sky detail. The L330’s auto white balance also performs well and is rarely fazed by mixed lighting conditions. Video mode is another minor disappointment though. Granted, its 720p recording resolution isn’t Full HD, but the level of detail in videos still falls short of what we’d expect. Audio is captured in mono rather than stereo, so don’t expect any aural amazement there either. You do get an interesting feature called Wind Noise Reduction which does exactly that, albeit negligibly. Alternatively you can ditch the video mode and switch to continuous stills shooting. No speed figures are publicised for this, but our testing revealed the Nikon Coolpix L330 to capture at approximately 1fps for a 5-shot burst, slowing to around a 2-second shot-to-shot delay once the buffer is filled. This underwhelming processing speed also manifests itself in the time taken to record a normal single shot image, whereby the camera makes you wait a frustrating couple of seconds between firing the shutter and being able to review the image. Back to the subject of cost-cutting and we get to the issue of power. The L330 relies on 4x AA batteries for its juice, which is nice if you’re away from mains access and need a quick camera refuel. However, it does mean the price of the camera isn’t quite as low as it seems, as realistically you’ll need to shell out an extra £20/$30 for some NiMH rechargeables to get some cost-effective power. Do this and you can expect an impressive 580 shots-per-charge from four 2300mAh-capacity cells. Should you slot in some alkalines instead, then the L330’s CIPA-rated 370-shot lifespan is also very good, but it’s dwarfed by the whopping 960 shots achieved by splashing out on a pack of premium lithium cells.